A very senior director is a member of a Board which always meets at one of the airport hotels at Heathrow, to the west of London. He always used to be late, and always had what sounded like a plausible excuse, usually to do with the traffic, which indeed is usually very bad. This might have worked with a lesser group, but he was trying to use this excuse with a group of about eight equally busy people, all of whom always managed to be there on time! We all struggled to get him to understand that in our view, it wasn’t too much to ask that he should be at the meetings on time. Eventually, I asked him, “Peter, do you ever go on holiday?” He looked at me as if I was mad. “Of course,” he said. “Well,” I said, “Do you ever travel from Heathrow Airport?” “Yeees,” he replied, beginning to suspect where I was going with this line of questioning. “Well, how often have you ever missed the plane?” He went silent as he reflected on the implications of the question. He was only late, it seemed, when it was ‘only’ his colleagues waiting for him. He assumed they would collude with his excuses and not call him on his tendency to keep them all waiting. But when it came to possibly missing the plane to go on holiday, there was nothing he wouldn’t do to make sure he was there in good time. It was all he needed to finally get his act together, and he has never again been late for a Board meeting. Managing people operating at Level 3 is, as you can imagine, a joy. Just make sure the agreement is clear, and step out of their way! In fact, it can be quite a shock managing someone who operates at this level, because they spend so little time cooking up excuses for why it can’t be done, or can’t be done on time, that they seem to get on with things faster than you would have thought possible. My business partner and I have a highly respected member of our support team, who never makes a fuss and never misses a deadline. In fact, we’ve learned not to email her in the evenings or at weekends to suggest an idea we’ve just had, because we’ve learned that she usually just does it. Right there and then! She knows that it’s often quicker to do it (within reason) than to waste time adding it to a list or wondering where she’s going to find the time. But we are not used to people operating that way, so we are embarrassed to find she’s given up a part of her private time to do something for us. What they haven’t understood is that, in making a promise and accepting a standard and a deadline for a piece of work, they have made it their job to manage every aspect of the process it takes to fulfil that promise. This is an attitude change that can take some intensive coaching to shift. One thing that often works is to point out that they could refuse to take the job on. A clear ‘no’ is much easier to manage than a ‘maybe’. Most people don’t want to take the consequences of saying ‘no’, so this then forces them to consider how they might be able to say ‘yes’ and still ensure that they are able to deliver. See our recent blog post for some helpful guidelines in giving simple, direct requests. How do you apply this mindset to your leadership? Approach with caution! Work on yourself first, and be scrupulously honest about whether or not you’re behaving at an appropriate level of accountability. Make sure you are squeaky clean – your management and coaching of others will only be effective if it’s based on your own experience. No-one is above behaving at Level 1! 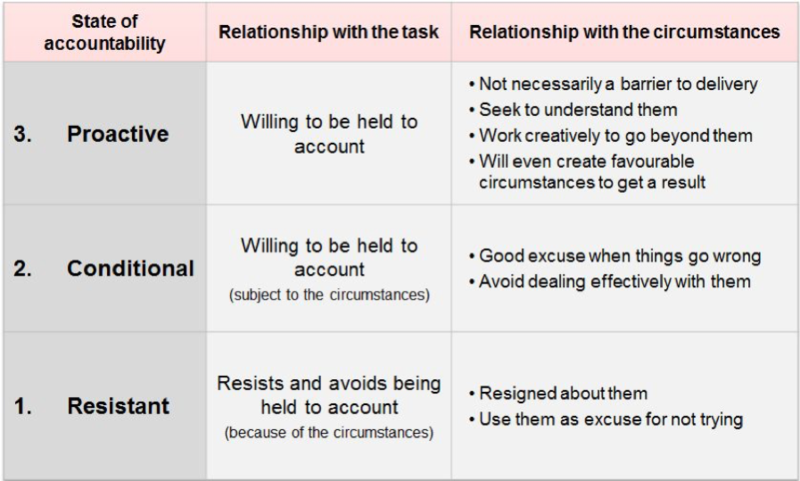 Equally, nobody operates at Level 3 accountability all the time. Don’t kid yourself – and sort yourself out. If you really can’t see yourself doing something, say ‘no’. Of course, you’ll also have to deal with the reaction, but it’s much easier for the other person to deal with a ‘no’ than a conditional ‘yes’. It also has the merit of being honest, and of not leaving you with the guilt and worry of a task that you know in your heart won’t be done properly or on time. Manage people’s expectations – if you let people know you’re going to be late before you actually are late, and in good time for them to react, you are at least still being accountable. You still need to be aware that they may not be very happy with you though. Be mindful/aware of what’s going on in your head when you make a promise – don’t make one if there is, at the time of making it, any foreseeable chance of breaking it. Or factor in right at the outset the time and extra effort it will take to fulfil the promise. In working with others, always insist on a clear no or a clear yes. You’ll see if they are wriggling. Recognise also that you may have to manage the process to ensure others don’t let you down. It’s not doing their job for them, it’s part of the job of managing people to be successful. Don’t do it forever, but be willing to train people for a reasonable period when you are beginning to work this way. There’s a lot of collusion with conditional accountability out there. Recognise this and create explicit agreements with your team members that ‘we don’t do it that way here’. They’ll be surprised, but when they get it, they’ll be grateful.